In true teaser fashion, there’s not a lot here in terms of substance. But it sets a mood and a tone we aren’t used to, while raising a few questions. Check it out, thanks to Entertainment Weekly. What we do see and hear in that trailer is some familiar music. Some familiar noises. Someone is working on something in a barn. It lights up. Then, obviously, the reveal of the Ecto-1 being hidden in said barn. That seems to be the biggest clue here. Yes, someone is working on a proton pack or something similar. Who that is or why they are doing that, we don’t know. But the car, under the tarp, in a barn, may just suggest that after the events of Ghostbusters II, the Ghostbusters had actually won and there was no need for them anymore. 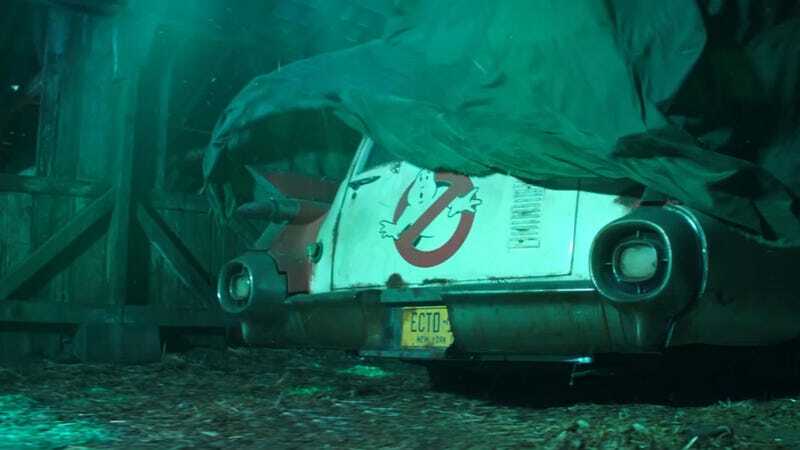 So the Ecto-1 was put in a garage (definitely outside of Manhattan) to collect dust for a few decades and, well, now it’s needed. That’s all guesswork but it’s my first impression. The camerawork and cinematography also give off a more Evil Dead/Stranger Things vibe than the original Ghostbuster films, which came out in 1984 and 1989 and were both directed by Jason’s father Ivan. So you have to think the director of Up in the Air and Thank You For Smoking is also hinting that his film will feel and look a little different this time around. Filming on the new Ghostbusters is reportedly scheduled to start later this year with an eye on that summer 2020 release date. Rumor has it, Reitman is looking for four teenagers for the main roles. We’ll keep you posted.